Good, but borrowing heavily from elsewhere, Sonic Lost World may well be one of the best Mario games you've never played. Ever since the sublime Super Mario 64 first hit store shelves in 1996, Sonic has been playing a game of catch-up. Sonic Adventure, Sonic Shuffle, Sonic & SEGA All-Stars Racing, Sonic Chronicles, SEGA Power Tennis, all of these draw heavily from Mario’s own diverse, genre-hopping repertoire, with varying degrees of success. They say imitation is the sincerest form of flattery, but just where do you draw the line between reverence and outright plagiarism? 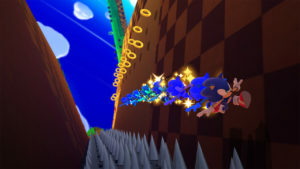 The fantastic, if iterative, Super Mario Galaxy may be getting on a bit now, but that hasn’t stopped SEGA appropriating its trademark level design years later for most recent 3D platforming entry, Sonic Lost World. Originally released on the Wii U in 2013 to an unfairly ambivalent reception, SEGA saw fit to issue a surprise PC iteration in November last year. 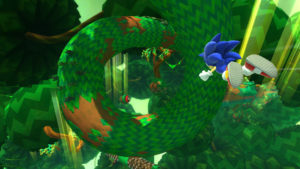 As with Galaxy, levels consist mainly of a series of 360 degree floating mini-courses, which Sonic is, for the most part, stuck to. When you complete each one, you’ll be typically thrown through the air to the next by some means of propulsion or another until you reach that all important box of beleaguered, imprisoned animals. More traditional side-scroller and behindy-cam stages are also present and correct, offering a much-needed injection of variety. The Colour powers from Sonic Colors (they spelt it all American-like on the box, so I guess that’s its official title) also make a not unwelcome appearance. Although Steam’s listed system requirements might be a bit optimistic, Lost World’s no system ‘hog. Yes, that just happened. The aesthetics here are pretty much platforming by numbers. The go-to stage themes, ice, desert, green and leafy etc, are all present and correct, and the twinkle of collected rings, jingle of extra lives and sound of badniks popping are pleasingly familiar. The badniks themselves are all lifted from classic Sonic games, although bosses come primarily in the form of The Deadly 6, classic Pixar-style CG baddies who serve as Sonic Lost World’s key antagonists. Proceedings may sound a little over-familiar thus far, but to write Sonic Lost World off as such would very disingenuous indeed. The gameplay flow is spot on, and couple of key gameplay differences in particular actually give the game quite a unique flavour among its series peers, at least. First of all, this time around you’ve got to hold down one of the triggers on your controller of choice to make Sonic run, and even then he doesn’t go very fast without some kind of boost. While an understandable design choice given Lost World’s slower overall pace, holding triggers down for extended periods can become uncomfortable. It’ll be certainly be interesting to see if Sonic Team sticks with this in the future. Secondly, Sonic’s homing attack now locks onto multiple targets at once, requiring one mid air button press to dispatch everything caught in his steely gaze in one fell sweep. If, like me, you’re used to having to press A over and over to hit each enemy individually, this new system takes some getting used to. Thankfully, this approach does much to improve the game’s flow, once muscle memory kicks in. While these changes work well for the most part, I’ll concede that they may not be to all fans’ tastes. However, there’s another aspect of Sonic Lost World that belies what we’ve come to expect from modern Sonic in a very positive way. SEGA have been struggling to find a suitable tone and theme for the series since first gifting Sonic with vocal cords some 17 years ago now. Thankfully, Lost World is an enormous step in the right direction in this regard, featuring beautifully animated cutscenes and a not unlikeable script. It’s clearly written for children rather than adult fans of classic Sonic, but feels more focused and satisfying than the cringy, violin-laden melodrama of Sonic ’06, for example. This and the solid, if heavily borrowed, gameplay make Sonic Lost World the best Sonic game, barring Generations, since the fall of the Dreamcast. Ethics and games journalism is not a topic I want to go into in depth here, but I do believe that Sonic Lost World was unfairly mauled by many outlets when it first released, and I can’t help but think that reader expectations (i.e. the widespread perception that 3D Sonic games are poor and must be reviewed as such, lest critics put their credibility on the line) probably factored into that. I’d recommend the game to any Sonic fan without hesitation, even if it still falls short of being the one we’ve been waiting for all these years. Given SEGA’s current focus on PC and mobile, it’s tempting to think that big budget 3D Sonic may well be a thing of the past. What a shame it would be, though, to mothball the main series just as Sonic Team are on the cusp of finally getting it right. Poor Sonic. Even at his best, he’s still behind the curve.